The Adventures of Tintin is Steven Spielberg’s first foray into a fully-animated feature film as director and… it shows. Overall, Tintin is quite a fun ride. Tintin (Jamie Bell) is an adventurous young reporter who stumbles into a mystery of the sort that can get one killed – all because he bought a model of a ship called the Unicorn. The secret contained in the ship gets Tintin hit on the head several times throughout the film, kidnapped, almost killed, and stranded in the middle of a desert with his adorable dog, Snowy, and the perpetually-drunk Captain Haddock (Andy Serkis) as his companions. Note: I am not particularly enamoured of Tintin – I don’t think I’ve ever properly read a single one of the books, apart from browsing through them briefly when in bookstores. The drawings are always lively and clear, which I like, but I think I always preferred the sharp wit and hilarity of Goscinny and Uderzo’s Asterix comics to Hergé’s more subtle style for Tintin. So this is the “regular”, non-fan perspective. The film moves rapidly (1 hour and 47 minutes) and after the first third of it, barely seems to stop to catch its breath. It isn’t rushed, but it does move very quickly. Good for those with short attention spans, but I personally favour it when films pace themselves a little more. By all means, the pace should pick up around the climactic moment, but when you spend two thirds of the film running alongside the main characters, trying to keep up, it gets a tiny bit exhausting. When the trailer for Tintin was released, I thought that it might have been better for them to animate Tintin the old 2D way instead of going the 3D route. After seeing the film, I still stick to that opinion. The ligne claire style would have translated better in 2D animation, which automatically lends itself to the stylized appearance. But perhaps giving emotion and movement to eyes that are just black dots would have been rather difficult (e.g. you can’t show a character looking to the side unless he turns his head because his eyes are just solid black; there are no pupils and whites of the eyes). Regardless, I thought that turning it 3D removed the little spark of life and uniqueness that the comics had through the flat colours and line quality. I did really like the opening sequence, though. Still clearly 3D, but rendered in silhouettes of solid colour and animated with transitions that gave it a sort of Saul Bass feel – like the opening credits for Catch Me If You Can, but with a less flat, pictogram-ish look. Speaking of transitions, there was some clever usage of match cuts and dissolving transitions particularly during the part where it cross-cuts between Haddock and his ancestor. Taken on its own, the visuals of the film are pretty spectacular. Environment design and execution, atmospherics and particle rendering were all superb. Plenty of moments when the background looked absolutely real. Kudos to WETA Digital (of Lord of the Rings fame) on that. The characters, however… I can’t put my finger on it. Most of the time I had no issue with their appearance but every now and then something would happen in a second that just made me think something was slightly off. I’m not certain if it is due to the motion-capture method itself or if something was missed in the translation of the mocap data to the character animation that caused that vague feeling of oddity. It was probably not the appearance of the characters – they weren’t in Uncanny Valley nor were they subpar 3D creations. In fact, there were moments when the characters looked very, very real. Perhaps it is telling that those moments were moments when the characters were not doing much – a turn of the head, a gaze, the flick of a hand. They appeared less realistic in long shots than in close-ups, which struck me as unusual. Normally, if in close-up they look realistic then from farther away they will look no less real. But here somehow I got the impression that they looked more obviously like animated characters when I could see the whole body. Considering that the material rendering and texturing were really near perfect, this is truly weird. Or maybe I’m the weird one. John Williams wrote the music for the film but (as is typical for me) I didn’t really notice it until midway through the film. The music is good – appropriate and does add to the film, and there was a bit in the middle that had faint Indiana Jones overtones to it, but on the whole the music didn’t leave a deep impression on me. My biggest quibble with Tintin is the thing that makes it obvious that this is Spielberg’s first directorial foray into feature-length animation: too many fast, flying crane shots. It felt as though he was overindulging in the fact that cameras in digital space have no restrictions of movement and angle whatsoever and used any opportunity he could to have the camera soaring through the air, diving under structures, through spaces, following and going around characters. As this technique was mostly utilised in action shots, and mostly in the last two thirds of the film, by the end of it I had mild sensations of dizziness. (And this was a regular screening. Had it been a 3D one, I would have had a real headache.) After the second or third such sequence, I started wondering if Spielberg had enjoyed himself a little too much with the unhindered cameras and all the free space allowed by 3D-modelled environments. A few less flying camera sequences would probably have been better. Or at least more spaced out and not used so close together in the narrative. 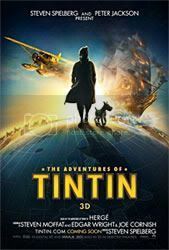 At the end of it all, my complaints are quite minor, and for people less bothered by details of animation and rendering technique or by over-use of flying cameras, Tintin is an enjoyable movie. The actors put up decent performances (Andy Serkis seems to suit this sort of mocap performance; he’s good at those exaggerated actions that suit the method), the storyline is easy to follow, there is humour (and a few witty lines, but no one in the cinema seemed to catch the amusement in those except me) and the film doesn’t drag. There’s also a little nod to Hergé at the beginning of the film when we’re introduced to Tintin, which was nice. Some people have compared Tintin to Indiana Jones. I would disagree with this comparison and say that you cannot compare them because the stories are essentially different genres. Indiana Jones is an adventurer, explorer and yes, grave-robber of sorts. Tintin is more detective than adventurer. Tintin asks all the questions – who, what, where, when, why and how? – and sets about finding the answers to those questions. In order to find the answers, he happens to have adventures. Indy goes: “What is it? Where is it? Okay, let’s go get it!” Indy just rushes head-first into adventure (or trouble, rather). Perhaps Tintin isn’t the sort of Spielberg film that will be considered “great”, but it is entertaining and enjoyable and has enough character in it that it doesn’t feel like a hollow shell of mere action and/or comedy.